Veronica dropped onto Netflix back at the tail end of February. A Spanish film directed by Paco Plaza, best known for the critically acclaimed REC films, it quickly gained a reputation as “the scariest film on Netflix.” I try not to pay attention to that sort of hype, but any film that was getting that sort of recognition is likely going to make it onto my watchlist. Last night I watched it, and I would’ve reviewed it right then and there, but it was late, so I went to bed. And then today I had a busy morning and early afternoon. So I hope you don’t mind that I’m getting this post out so late. Based on actual events,* the film follows Veronica, a Spanish schoolgirl living in Madrid in 1991. Since her father’s untimely passing, her mother has been working long hours at a restaurant/bar, leaving Veronica to care for her younger siblings. One day, Veronica and a couple of classmates bring out a Ouija board so that Veronica can contact her father’s spirit. Instead she contacts a dark entity that seems intent on not only haunting/killing Veronica, but her younger siblings as well. While I won’t say this is the scariest film on Netflix (Lord knows I haven’t seen enough of their selection to say that), it is a damn good scary movie. While the film is filled with the normal tropes of many possession movies–things moving on their own, scary invisible or shadowy entities, people acting totally creepy uner the influence of the evil spirit–they’re done so well that you forget that you’ve seen these tropes before. The actors all do a very decent job, especially newcomer Sandra Escacena as Veronica, who really makes you believe she’s this character and sympathize with her troubles. I also seriously loved Sister Death, a blind, elderly nun who helps Veronica realize what she has to do to fight the spirit after her (because of course there’s going to be a nun who gives advice). For an old blind woman, she’s a bit of a badass, and was never dull when she was on screen. But on top of that, the film doesn’t go overboard with the fact that it’s a period film. Most properties taking place in popular recent decades do everything in their power to remind you that they take place in that decade. And while that’s not necessarily a bad thing and is sometimes part of the charm (see Stranger Things or Ready Player One), it’s kind of refreshing to see a film that’s more focused on its story than on its culturally-popular decade. There are a couple of things that take away from the film. For one thing, there are trippier moments in the film, like a scene where Veronica is running across the print of a page from an occult magazine on the way to her mother’s restaurant, that feel rather unnecessary and add nothing to the film. On top of that, for being the titular character, Veronica isn’t the most developed character. Yeah, she’s a responsible teenager taking care of her younger siblings and misses her father, but those are just character tropes. They don’t make Veronica herself memorable like Carrie on prom night was memorable, or how Annabelle the doll is memorable without being anything more than a creepy, possessed doll. In the end, I’m going to remember the film more than I remember the actual character the film is named after. And as I said, this film is filled with a lot of familiar tropes. And while I’m fine with that, I know there are a lot of other horror fans who won’t care for that, no matter how well done they are. 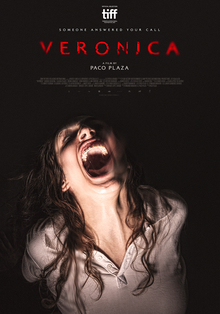 But all in all, Veronica is a definitely a new gem in the horror film genre. On a scale of 1 to 5, I’m giving this film a 4.5. Head to Netflix, turn it on, and get ready for an experience you won’t be able to look away from. *No seriously, something did happen. Apparently in 1992 a bunch of Spanish schoolgirls did use a Ouija board, only to have the ceremony interrupted. One of the girls later died because of a mysterious illness, which some have suggested might’ve been due to demonic possession. So while we’re not exactly sure what happened, there’s enough there that this film has more of a claim to the “based on actual events” tagline than Texas Chainsaw Massacre ever did.